Providing quality work that fulfills his clients' needs: Greg's practice is both that simple and that complex. He enjoys getting to know his clients' businesses so he can truly partner with them, discussing not just individual patents, but how those patents fit into the company's overall business strategy. Greg practices Intellectual Property law with an emphasis on client counseling on patent and copyright matters. His practice includes developing domestic and international Intellectual Property portfolios and strategies for effective and economical protection, with a goal of giving his clients a strategic advantage in the marketplace. He also chairs the firm's Copyright and Entertainment Law Committee and provides counseling for acquisition and enforcement of rights for art, music, publishing, licensing, and related legal matters. 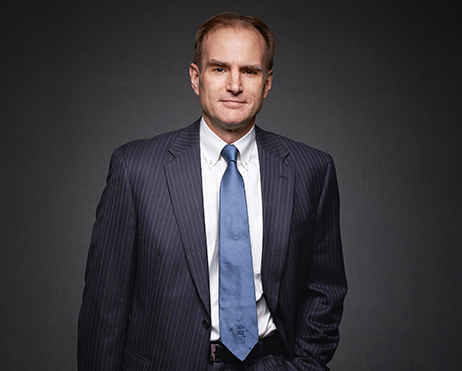 Greg has extensive experience in U.S. and international patent prosecution in mechanical and electro-mechanical areas. At Merchant & Gould, Greg serves on the Benefits Committee. 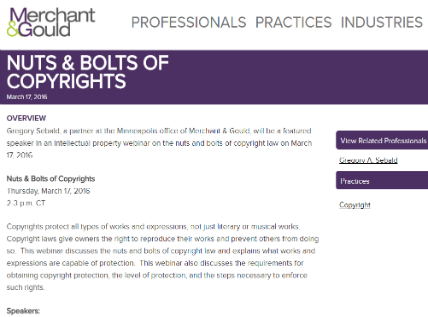 He provides pro bono copyright counsel for select nonprofits. Greg is an avid sports fan who loves to watch college and professional basketball and Twins baseball with his two boys. He also tries to be a Vikings fan.